So, you’ve got a new website built on WordPress. Congratulations! You’re already ahead of the game. WordPress is easy to use, intuitive and search-friendly. And if you’ve got a new website built on WordPress, you’ve got a new login address and admin portal for the site as well. Great. But what does it all mean? Relax. We’re here to introduce you to a few basics of your new WordPress website. Often, the first question we are asked about new websites is, “How do I post new content to my site?” Well, that depends on what you want to do. By content, most of our clients mean a blog post. Let’s start with that. 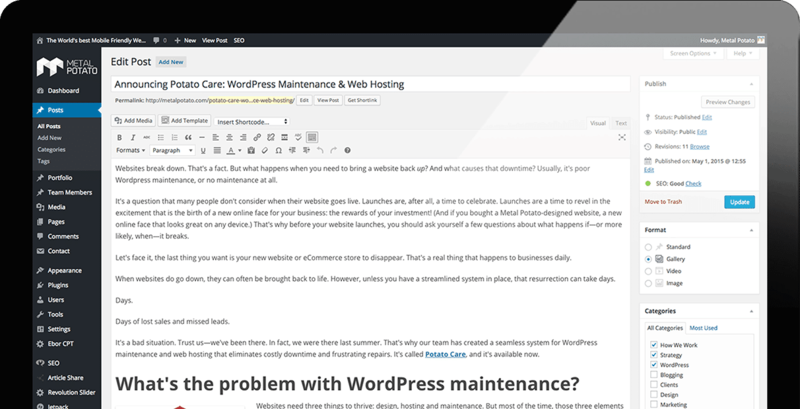 Even though WordPress is easy by content management standards, that doesn’t mean everything is crystal clear as soon as you login. Once you login, you’ll immediately notice a tool bar on the left hand side of your web browser. That’s where all of the goodies for managing your website are kept, and two of those goodies are easy to get confused—posts and pages. Both will technically “add” new content to your website, but posts refer directly to a blog post that can appear almost instantly on your website’s blog roll. Pages, on the other hand, are usually a more technical build that requires some backend web design help from us. 99% of the time, you’ll want to stick to creating a new post. So, what’s the best way to do that? Hover over the pushpin icon on your toolbar. Select “Add New Post”. That’s step one. You’ll be brought into a page that looks a lot like this. (Yes, it also looks a lot like Word. This is going to be easy.) On this page, you can simply type a headline for your blog and copy as if you were in a standard word processing program. WordPress even runs a spellcheck for you. Go ahead and type your blog, or—if you prefer—copy and paste it from a word processing program. Just remember to delete any extra spaces that may appear between paragraphs if you do. For best appearances, make sure to select an image that is at least 800 pixels wide and 150dpi. An image that looks low-resolution and crunchy in your email inbox is going to look even worse when plastered on your website. Avoid that. If you have to, look for some stock images. Follow the prompts to upload the image and click the blue “Set Featured Image” button on the right hand side of that widget. Your image is set. 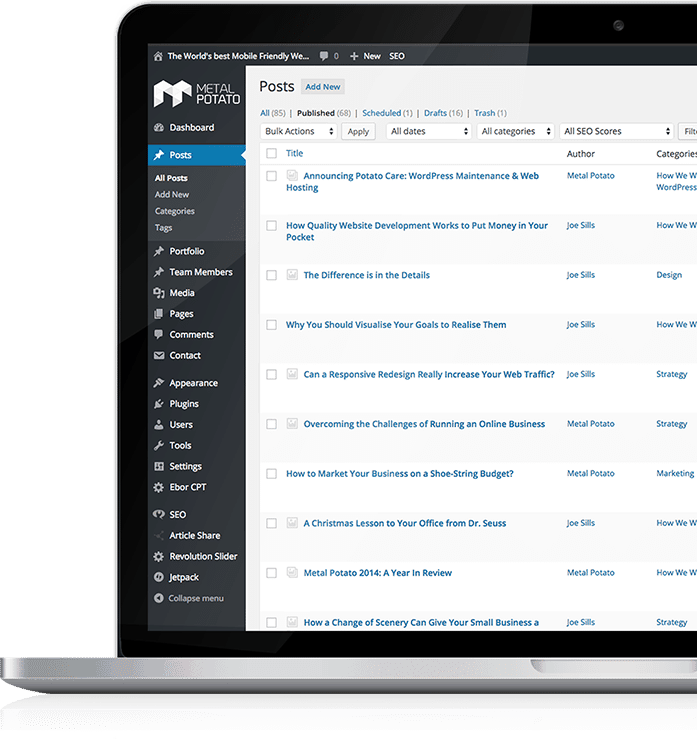 Next, you need to select a blog category for your post. This controls where on your website the post appears and, often, what other posts are displayed in correlation with your new one. Just check the appropriate box in the Categories widget (directly above Featured Image). You’re almost ready to publish your blog. Last step: again, on the right hand side of your screen, locate the “Publish” widget. It’s the uppermost one. See that blue button that says publish? Make sure your post is the way you want it and press it. BOOM. You’ve just published your first blog post. *Pro Tip: for most posts, you’ll want to have around 300 word minimum for search engine friendliness.